120 rounds of Federal Lake City XM855 comes packaged in a miniature plastic ammo can. 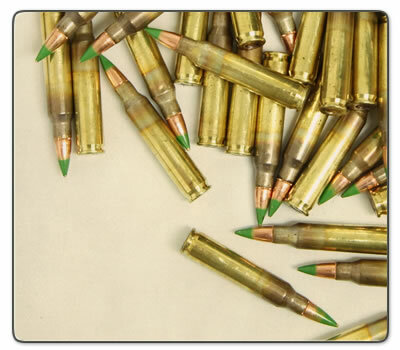 5.56mm M855 Ball Ammunition has a green bullet tip. Adopted by NATO in 1980, the new load has a spitzer boat-tail bullet. It also has much-improved penetration characteristics over the old M193 55-grain projectile at all ranges, resulting in higher retained velocity and greater accuracy at long range. The 5.56mm M855 is ideal for use in the M16A2 and M4 rifles. This 5.56 x 45mm NATO ammunition from Federal is first run, first-quality, 2014-production ammo with the green-tip M855 (NATO SS109) 62 grain FMJ steel core penetrator bullet. The boxer-primed, reloadable brass case is headstamped with the manufacturer symbol and date of manufacture. Water-resistant lacquer-sealed primer. Manufactured at the Lake City Army Ammunition Plant in Independence, Missouri, where every cartridge is visually inspected before packing.